We need to understand the importance of our health and well being. And we should take the informations which we stumble upon in our life time– learn, understand,adapt, practice,and make it our own. A few years ago, I met a woman, Hasreen in Salallah. This lady taught some basic things about our health[exercises and diet], which proved to be very useful. To this day , these theories are working so well. I wanted to gift[guru dakshina] her something special, so I embroidered a blouse with kantha work for her. The picture taken is not of high quality, all that I have is the memory of doing it. 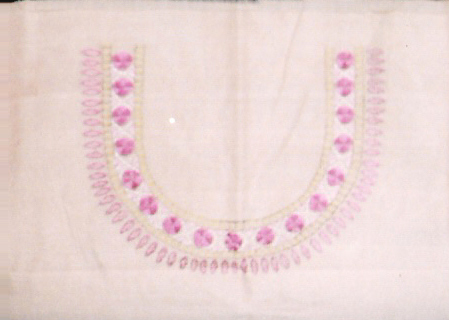 The blouse was to be worn with a saree. Front neckline is partially covered , generally back neck is embellished. Here also I followed the same idea. 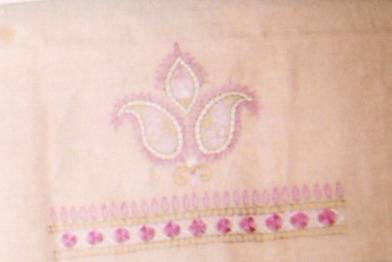 The pattern was designed for kantha embroidery[Indian embroidery from Bengal]. The colours- green and shades of pink. I made a paisley pattern for the sleeves, and border pattern on the neckline is done along with it. The picture was taken with a simple camera, I just wanted to share the idea here.